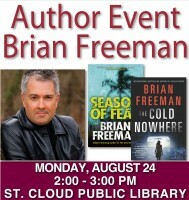 Criminals in Duluth know they're no match for Jonathan Stride; at least in the Duluth that author Brian Freeman imagines. Come hear award-winning mystery writer Freeman speak at the St. Cloud Public Library on Monday, Aug. 24 at 2:00 p.m. in the Bremer Community Room. He'll read from his latest novel, with a Q and A to follow. Freeman's books have been translated into more than 20 languages and sold in more than 40 countries. Meet this successful writer who makes his home in Minnesota.